Recommended Age: Suits 18-48 month children who are going to start their biking journey. The adjustable seats(11.22"--13.98" to ground) and handlebar(16.34"--19.1" to ground) allows the bike to fit your child's growth. Easy installation: Developed modular design, took only 4 steps to assemble. Easily done within 5 minutes, no tool required. 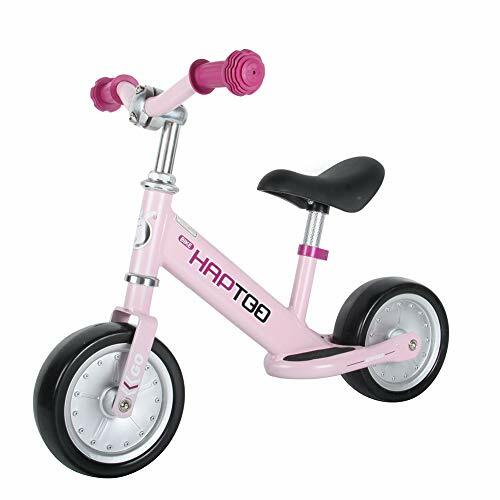 Product features: Sturdy but lightweight Aluminum alloy frame makes the bike easy to bring with, Puncture-resistant EVA tires along with ultra soft saddle and rubber hand grids will reduce vibration and offer maximum comfort for kids. The wider footrest design ensures your kid has a place to put feet while riding instead of worning sole. Happiness: Help to develop kids' balance, enjoy learning riding and gain confidence. Well packed gift Box, great choice for Christmas New Year Birthday present. Safety Guarantee: ASTM F963-11, EN71 Certification, CPSC Approved by US Lab. 30 days Money back guarantee.